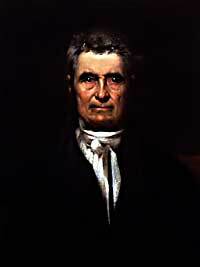 John Marshall, delegate to France during the XYZ Affair in 1797, became Chief Justice of the Supreme Court in 1801. Would the meddlesome Alexander Hamilton undermine his own Federalist party and the administration of newly elected John Adams? The Adams administration faced several severe tests. It was a mixed administration. Adams was a Federalist. Jefferson, the vice-president, was a Democratic-Republican. Federalists were increasingly divided between conservatives such as Hamilton and moderates such as Adams who still saw himself as above party politics. Hamilton opposed Adams as the Federalist candidate. This helped create the circumstances whereby Jefferson slipped past the Federalist candidate, Thomas Pinckney, to become vice president Although Hamilton resigned from the cabinet in 1795, he remained influential and his advice was sought and followed by many Federalists — even some who remained in Adams' cabinet. Beyond these considerable problems in his own party, Adams also faced a major international crisis. The French were outraged by what they viewed as an Anglo-American alliance in Jay's Treaty. France suspended diplomatic relations with the U.S. at the end of 1796 and seized more than 300 American ships over the next two years. 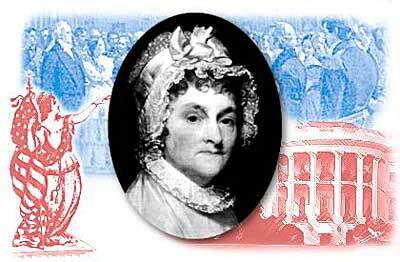 Abigail Adams was one of John Adams' most trusted counsels. During the years prior to American independence, the two kept up a consistent letter-writing where Abigail spoke of equality for all women as well as men. Adams responded by sending a diplomatic mission to France. When it arrived in Paris, three agents of the French foreign minister explained that to enter into negotiations America would have to loan the French government money and pay a bribe to the agents themselves. This became known in the United States as the "XYZ Affair." The French rebuff was seen as a blow to American honor and became a major rallying issue for Federalists, who were generally anti-French. In this 1798 caricature of fledgling America's relations with France, French directors try to trick America (represented by the woman) into giving them all her money. European sympathizers, bemoaning France's plundering of their own riches, look on. American popular support for France weakened dramatically as the Federalists effectively used the slogan "millions for defense, but not one cent for tribute" to strengthen their political position. Federalists who controlled the Congress as well as the presidency raised new taxes, dramatically enlarged the army and navy, and generally increased the power of the central government in preparation for a war against France that seemed inevitable. The Adams administration entered a "quasi-war" with France from 1798 to 1800. Although no official declaration of war had been made, the United States clearly acted as an unofficial ally of Great Britain. Only 15 years since the end of the Revolutionary War, a dramatic transition in American international alliances had occurred. While royal France had supported colonial America in its revolutionary fight against the British, republican America now joined with Britain, its former Revolutionary enemy, to challenge the French. In spite of this dramatic change, Adams' anti-French policies were extremely popular and significantly enhanced his public standing. 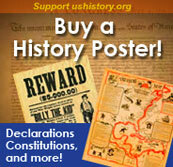 John Adams did not have enough support from the American people to win his reelection as President in 1800. There were some serious problems in his presidency, notably the XYZ Affair and the passage of both the Alien and Sedition Acts. There were high points in his presidency as well, so take a look at this page created by students for students to see how the world now views the Second President of the United States. An online biography about the life of one of the most influential men in the history of the United States, written just 8 years after his death. The book is broken up into chapters, each with its own link. Click "26. Vice President" to find out how Thomas Jefferson came out of "retirement" to become John Adams' Vice President and help shape the nation as it headed for a new century. Both President John Adams and his Vice President, Thomas Jefferson, died on the same day — July 4, 1826 — exactly 50 years after the signing of the Declaration of Independence. John Adams wasn't pleased to be second-in-command. He called the Vice Presidency, "the most insignificant office that ever the invention of man contrived or his imagination conceived."